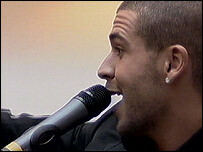 The X Factor winner Shayne Ward has launched his bid to be the Christmas number one by performing his single live in his home city of Manchester. Ward, 21, sang That's My Goal before hundreds of fans - mainly teenage girls - at the Arndale Centre. The appearance launches a promotional tour by Ward which coincides with the release of the single. Bookies and retailers have tipped the song to clinch the coveted top spot, snatching it from Nizlopi's JCB Song. 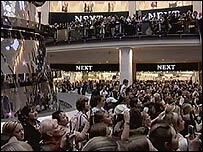 HMV said "huge" early morning sales showed he was on course to beat the competition. Other contenders include See the Day by Girls Aloud, Eminem's When I'm Gone and a re-release of the Pogues and Kirsty MacColl track Fairytale of New York. Ward won the ITV1 talent contest on Saturday, winning a £1m recording contract with impresario Simon Cowell's company. He was crowned victor after a tense final which saw rival Andy Abraham pushed into second place. Ward, who used to work at a branch of clothing chain New Look in the Arndale Centre, was watched by his mother Philomena as he performed the song before he signed autographs and posed for photos. He said: "It hasn't hit me yet that I have won it. It doesn't feel real, even yet. Everything has happened so quickly. "I have had a good talk with Robbie Williams. He actually came and found me and congratulated me because he had been watching the show. "He had been texting and voting for me to win as well. "He said, and I am sure he really did mean it, that I'm going to have a great career. "People have said that they can see a young him in me, and he agreed in front of me. It was fantastic." Both HMV and Virgin retailers have tipped That's My Goal for the festive top spot. The chart will be revealed on Christmas Day. But the unusual midweek release of The X Factor winner's single could give Nizlopi a small chance of remaining at the top for another week. Monday is the traditional day for single releases.